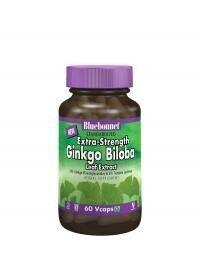 Bluebonnet’s Standardized Extra-Strength Ginkgo Biloba Leaf Extract Capsules provide Ginkgoselect® from Indena, a standardized extract of ginkgo flavonglycosides and terpene lactones, the most researched active constituents found in ginkgo biloba. A clean and gentle water-based extraction method is employed to capture and preserve ginkgo biloba’s most valuable components. Available in easy-to-swallow vegetable derived capsules for maximum assimilation/absorption and for a truly vegetarian/vegan formula.